Is there a Link between Vitamin B and Multiple Sclerosis? Background: Damage to the myelin sheath (demyelination) is one of the main manifestations of multiple sclerosis (MS). Interestingly, both MS and vitamin B deficiencies result in severe myelin degeneration, leading to loss in neuronal signal transmission. 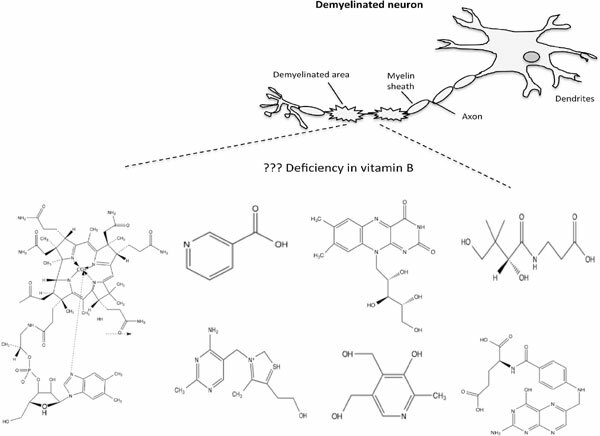 Objective: Deficiency in vitamin B complex vary, although common symptoms include fatigue, increased oxidative stress, inflammation and demyelination. In particular, vitamin B12 (cobalamin) has had increased attention for its role in the methylation process, involvement in myelination and remyelination, and reversal of MS symptoms. Method: Here, we discuss the role of vitamin B complex (B1, B2, B3, B4, B5, B6, B7, B9, B12) in MS. Results: The anti-inflammatory and re-myelinating attributes of vitamin B complex members are promising, despite limited clinical studies. Conclusion: There is an urgent need for larger studies to determine the role of vitamin B supplementation alone, or in combination with other therapeutic agents, in prevention or reversal of MS, and aid in improved quality of life of MS patients. Cobalamin, EAE, folate, multiple sclerosis, niacin, pantothenic acid, riboflavin, thiamin, vitamin B.